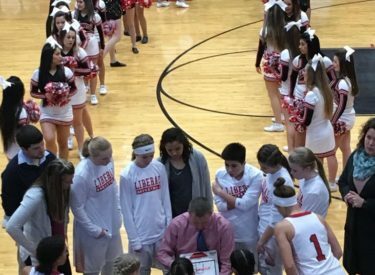 Liberal students of all ages won’t have to pay admission to attend the Lady Redskin basketball game against Great Bend Wednesday night in the Big House. Various businesses have donated enough money that all USD 480 students will be let in free at the LHS Varsity Girls BB substate game this Wednesday at 7 vs Great Bend at Liberal High School. LHS girls are the #1 seed and ranked #3 in 5A. The students must show up by 6:45 to get in free that way we have a big crowd at the start of the game. Like in previous years, there will be a line to the left with someone keeping track of the students. The game will also air on 1270 and kscbnews.net. The Liberal boys play at Topeka West on Tuesday at 6. Redskin Pregame begins at 5:45 on 1270 and kscbnews.net.